The Burkburnett Police Department is dedicated to a standard of excellence in promoting and maintaining a safe and peaceful community. We serve in a community partnership to preserve order, protect life and property, enforce laws and ordinances, and safeguard individual liberties. We conduct ourselves according to the highest ethical standards and treat others with fairness, dignity and respect. We pledge to manage our organization with professionalism, leadership and integrity. 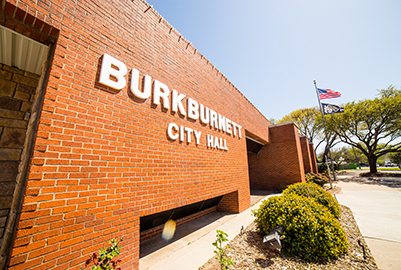 To accomplish this mission, the Burkburnett Police Department is manned with a compliment of 19 sworn full-time officers, and one sworn Reserve Officer. The department currently consists of a Chief of Police, one Lieutenant, three Sergeants, two Corporals and twelve Patrol Officers. The department is further divided into a communication department with four full-time and three part-time communications operators, a criminal investigative division, narcotics division and a patrol division (including bicycle patrol). Additional members of the department include: a Certified Arson Investigator, a Fire Marshall, an Emergency Management Coordinator, and a SWAT Team. The patrol division is the nucleus of the department. The patrol activity provides 24-hour service, 7 days a week, 365 days a year. Responsibilities include the apprehension of criminal offenders, repression of crime, preliminary investigations, traffic enforcement, accident investigation, ordinance enforcement, preparation of criminal and incident reports, community relations, testifying in court, and other public service requests. The Police Department is located at 208 East Fourth and the non emergency phone number is (940) 569-2231. For an emergency situation call 911. Chief Ed Stahr began his law enforcement career in 1989. During this time he has served as a Patrol Officer, Fire Marshal, Detective/Investigator, and Emergency Management Coordinator. Chief Stahr currently holds a Master Peace Officer License. 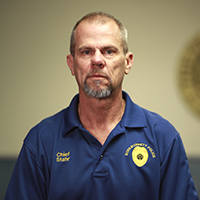 He has been employed with the City of Burkburnett since 2006. He was appointed the Chief of Police in October 2013. Chief Stahr is a native of Mississippi. Chief Stahr attended Wichita Falls public schools and also attended Vernon College.